46: Windshield Installation – Again! I’ve reached that annoying phase in the restoration of the 1967 E-Type 2+2 where I’m finding things that I need to do over. Maybe I hurried through it the first time and did a poor job or maybe things are not holding up to the rigors of actually using the car. Case in point is the installation of the windshield. When I did it the first time, the gasket that I purchased appeared to be slightly too big for the opening. After trying to install the windshield with a too big gasket and finding it just wouldn’t go, I resorted to cutting the continuous loop of the gasket and taking out a short section of length. As time has gone by, the cut ends of the gasket seem to be getting farther apart, leaving an unsightly gap. The final straw was when I was fussing with the installation of the locking strip, the gasket split. Some of you may not be up to installing a replacement windshield in your car but read along, as the information you gain from this article may also be helpful in explaining the job to your installer. 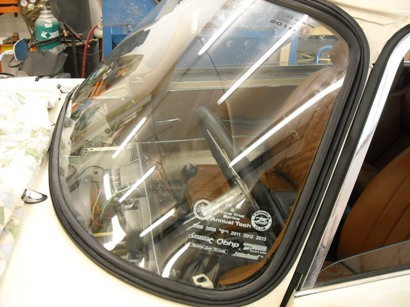 I spoke with Mark Lovello and he notes that the windshield installation used on an E-Type also applies to the XJ6 and XJS cars from the 70’s and the 80’s. So I spoke with Tony at SNG Barrett and he said that the too long gasket I had been trying to install was a gasket for a Series 2 car. He promised to send me the correct gasket and, as the subsequent successful installation attests, he did indeed send me the right one for the job. My car did not have the chrome trim strips, also known as finishers, installed. If they are installed, they should be removed first. On the E-Type there are special pieces on the A pillars. As delivered from the factory, these were glued on. As with any 40 year old car, creative folks may have attached them differently during previous windshield installations! Across the bottom and top horizontal surfaces are C shaped trim strips that are embedded in grooves formed in the gasket. Mark noted that these can be difficult to remove but there is no mechanical attachment, just the tight fit of the metal edge into the groove of the gasket. Take care with these pieces. They are frightfully expensive to replace. 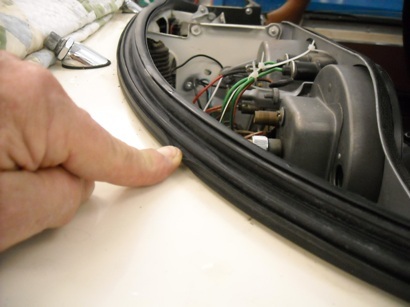 Next take a sharp knife and sever the old gasket around the edge of the windshield glass. A thin strip of gasket can be removed, revealing the edge of the glass. If the previous installer used a sealant, you might also have to run the knife between the inside edge of the glass and the gasket to sever the sealant. At this point, the windshield can be pushed out from the inside and laid onto the bonnet. Note that before I started this job I removed the dash cover but I found that this really isn’t necessary to do the job. Next remove the remainder of the old gasket. If you are going to install a new windshield, remove the old one from the bonnet. Next the gasket can be fit around the inside of the metal opening in the body that forms the windshield. You should note several things as you examine your gasket. The side that faces into the interior of the car has no grooves. Conversely the outside has 5 grooves. If the outside of the gasket was a clock, there is a groove at 9 o’clock that fits over the metal edge on the scuttle, a narrow groove at 10 o’clock that accepts ½ of the C shaped trim strip, a wide groove at 12 o’clock that accepts the rubber “locking strip”, a narrow groove at 2 o’clock that accepts the other side of the C shaped trim strip, and wide groove at 3 o’clock that accept the edge of the glass. In the picture below you can see the middle 3 grooves. The gasket, if of good quality, will have pre-formed 90 degree bends that should mate up with the two tight corners where the A pillar meets the roof. Drape the gasket into the correct position and fit the groove on the outside edge over the sheet metal edge of the windshield opening, as shown in the picture above. You may have to temporarily put a little masking tape on the gasket as it attaches to the roofline to keep it from sagging down. Next comes the hardest part, which is getting the windshield inserted into the groove around the inside of the gasket. 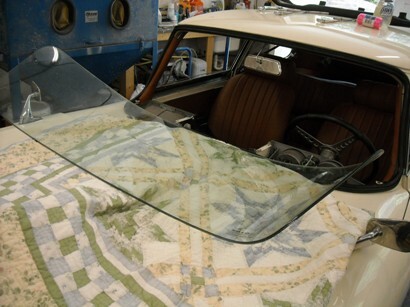 Fortunately, the gasket has a “secret” feature that makes the windshield fitment possible. The middle gap, the one described above at the 12 o’clock position, is empty at this point and allows the gasket the compress and/or roll outward. Once the windshield is installed this gap with be filled with the “locking strip” capturing the windshield securely. So here we go. I started on the lower edge, letting gravity work in my favor. I also lubricated the groove with a mixture of Dawn detergent and water. Initially, you will be able to use your fingers to work the groove over the edge of the windshield. Fingers are good as they are soft and don’t risk damaging the glass or the gasket. But at some point as you work your way around things will get tougher and you will need to use a tool. 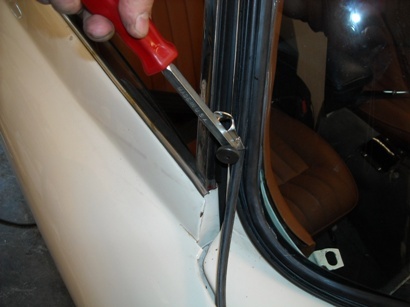 In the picture below, I am using a cheap tool I bought to remove door panels from doors. Any flat wide dull implement, such as a butter knife, will work fine. Just be careful and don’t put any force on the glass edge, as it can and will crack. Believe it or not, my windshield went into the groove all around fairly uneventfully. You are almost ready to insert the locking strip. I did a trial run to figure out how this worked. I bought the tool shown in the picture from a vendor on Amazon. Look for Blue Point # YA208A available from many sources like Snap-on or Matco. It is a must have tool to do the job. The locking strip is a triangle shape. The point of the triangle fits into the bottom of the groove. The wide edge of the triangle faces outward. The tool holds the groove open and allows the locking strip to be inserted. Once I got the knack of installing the locking strip I pulled it back out. Then I carefully inserted a small amount of clear silicone caulk between the gasket, the metal edge of the windshield opening, and also between the groove and the glass. Then, as you install the locking strip and it expands the gasket to its final position, it will push the excess silicone out. Wipe off the excess as you go. The locking strip of course will have a start and an end, with a small gap. This gap will be covered up by the chrome trim strips. And so there it is. Your new windshield is installed. Refit the various chrome trim strips and then give yourself or your installer a big pat on the back! I got it at XKs Unlimited. SNG Barrett is also a good option.